With the blending of advance technology and modern design, La gourmet® “Cook & Pour Series” brings to you a range of cookware which is not only of superior quality but adds to your cooking convenience. Its unique pourspout and colander cover allows for easy pouring, straining and helps to avoid spills. The 3mm 3ply encapsulated bottom has an aluminium core to ensure that the heat spreads evenly and thoroughly. This allows you to save time & energy as your food is cooked faster. Cookware should be well balanced and sturdy enough to prevent denting and warping with ordinary use. The bottoms should be flat, to spread heat evenly. Handles should be strong enough to support the pan and comfortable to maneuver. Lids should fit snugly onto the pan to avoid rumbling during cooking. La Gourmet® cookware meets all these requirements!!! – Because of its suitability for any kind of cooking method and any type of ingredient, stainless steel is the most versatile all purpose cookware material. – Stainless steel especially 18/10 with its higher nickel content is nonporous and nonreactive; that is, it doesn’t corrode when it comes into contact with acidic ingredients such as lemon juice, tomatoes or wine, vinegar nor does it gives an off-taste to foods. – Stainless steel is durable, resists denting and scratching and holds its shine even after years of cleaning. Body: 0.8mm body, cut edge. Bottom: 3mm s.s / allu capsule base. special lid: glass lid with s/s pour rim. 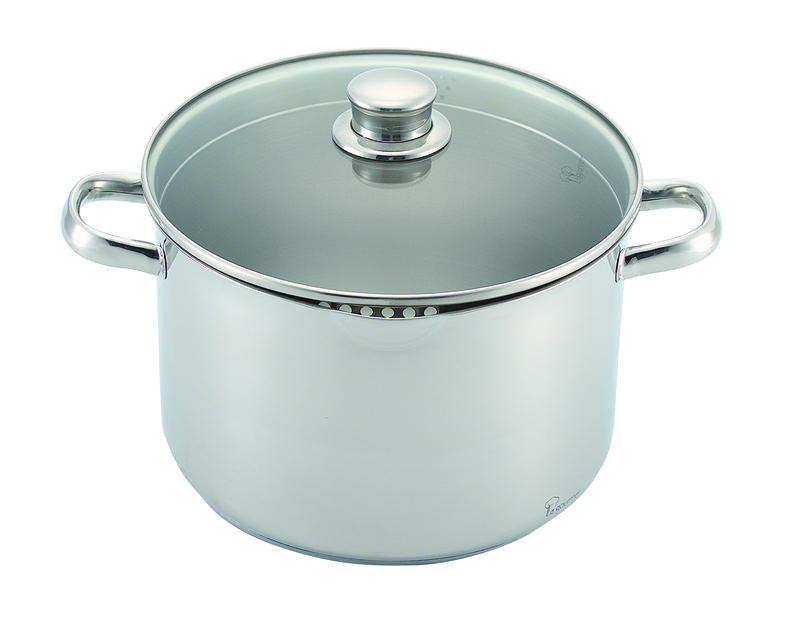 suitable for gas, electric, ceramic and induction cookers.